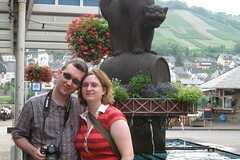 Thursday continues with a stop in Zell (home of the famous Zeller Schwartze Katz), a scenic drive along the windy Mosel, and our arrival in romantic Beilstein, a place out of time, instantly charming. We check into historic Hotel-Haus Lippmann, home of the duke who originally ruled Beilstein, have a lovely dinner on the terrace above the river, and do a bit of twilight sight-seeing before concluding our evening with drinks and dessert on the terrace as night takes hold. Got the map handy? (Good!) These photos cover items twelve and thirteen on the itinerary. Music: Rusted Root - "Cat Turned Blue"